Developed on behalf of the European Commission (DG MOVE, DG RTD and DG JRC), the TRIMODE integrated model for Europe combines the simulation of transport, economy and energy systems for the assessment of major transport infrastructure projects and policies. Within a single software platform, the model components include a full four stage Transport demand model of passenger and freight movements, an Energy model with dynamic vehicle fleets for all transport modes and an Economy model representing the complete macroeconomic system of European countries with a two-layer General Equilibrium model that works at both a regional and a national level. Covering the whole European Union and its neighbouring countries, the model has a very detailed spatial resolution of the transport system, with a NUTS III level multimodal network, coupled with detailed disaggregation of transport demand. The model considers all types of energy sources and technologies for all modes of transport. 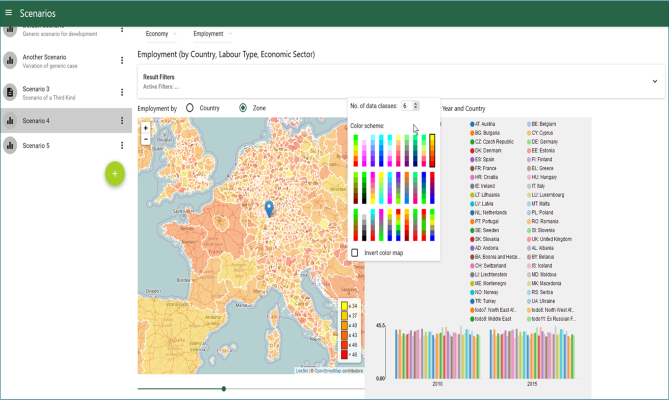 Based on previous European-level and national models which provided many of the methodological foundations, TRIMODE is the first example of a large scale integrated model developed where the structure of each model component has been designed afresh. Policy scenarios: TRIMODE is designed to assess the impact of a large variety of policy scenarios: (i) TEN-T infrastructures, (ii) transport energy taxation and differentiated vehicle taxation, (iii) user charges (e.g. road charges, track charges, slot charges), (iv) internalisation of external cost, (v) increased share of renewables in the transport energy mix, (vi) improvements in energy infrastructure supporting the use of alternative fuels in transport, (vii) efficiency and GHG emission standards, (viii) electric mobility and charging networks, (ix) diffusion of new powertrains. The model could be applied also to assess the impact of modifications of background conditions, e.g. energy prices, productivity trend, ageing and population growth. Modular structure: the Economy model estimates the zonal demographic, economic activities and change of bilateral trade in a particular year for all zones of the model. At the same time, the Energy model determines the composition of vehicle fleets and provides the operating costs that are then used to estimate user costs. 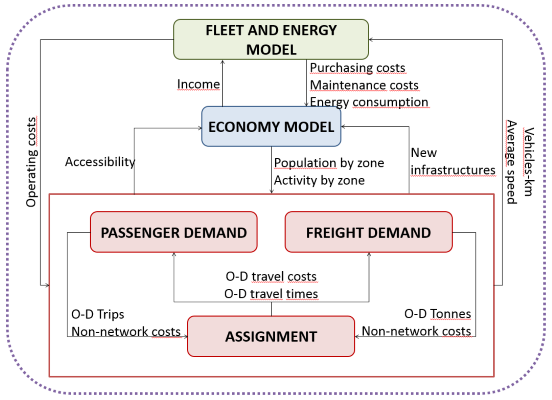 These user costs are a major input for the Passenger Demand model and Freight Demand model to estimate the resulting spatial pattern of passenger and freight transport movements and how these are allocated to modes and to the vehicle types. The Network model assigns these vehicle movements to the paths and links of the multimodal network. The transport demand and the assignment modules are iterated to reach the equilibrium and the outcome is fed back to the Energy and Economy models. Interactive software platform: based on PTV Visum platform, GAMS software and Python scripts, TRIMODE offers transparent access for two classes of users: (i) model analysts and (ii) model developers that will make use of different options to run the model.